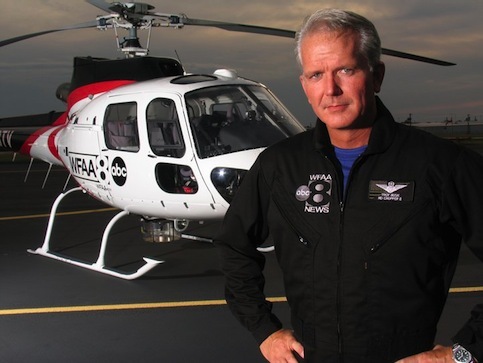 Fear of not flying has prompted HD Chopper 8 pilot/reporter Troy Bush to call it a day at Dallas-based WFAA8. His last day at the station will be April 6th, he said in an email to unclebarky.com. Rusty Thetford, who "showed me the ropes of ENG (Electronic News Gathering) flying in Dallas," will now be flying Chopper 8, Bush said. Bush recently completed his fourth year as WFAA8's go-to guy in the sky during times of flooding, fires, storm damage and other events calling for an airborne perspective. "WFAA was my dream job ever since I started flying in 1987," Bush said. "Unfortunately, the economy has hit the TV business hard. It's forced WFAA to reduce our flight time drastically. I would rather get hit in the head with a hammer than not fly. I'm a pilot that reports, not a reporter that flies." Bush said he'll be returning to the Gulf of Mexico, where he flew crews to rigs for many years before joining WFAA8. "Despite what you hear in the news, oil and gas exploration is booming." For the past two years, rival North Texas TV stations have relied on Garland-based Sky Helicopters, Inc. during times when WFAA8 continued to fly solo with Chopper 8. Financial reasons were cited. "WFAA actually owns our bird free and clear," Bush said. "I doubt they would ever go the generic route with Sky Helicopters." Bush and Chopper 8 memorably covered the Sept. 2010 flooding in Arlington while also giving the city's fire chief a ride so that he could see the scope of the damage first-hand. All four major local TV news providers offered extended live, breaking coverage, but WFAA8 clearly had the first and best overhead pictures. In goodbye sentiments sent to unclebarky.com, Bush thanked WFAA8 managing editor Cliff Williams for "taking a chance on someone with no TV experience." He likewise thanked "all the reporters I worked with, especially (news anchor) John McCaa, (traffic reporter) Alexa Conomos and (Daybreak co-anchor) Cynthia Izaguirre." "You guys always made me feel I was a star," he said of the WFAA8 staff in general. "I will miss you all."